Grant Road widening Phases 2 and 5 cut through Jefferson Park, Samos, and Mtn/First neighborhoods. 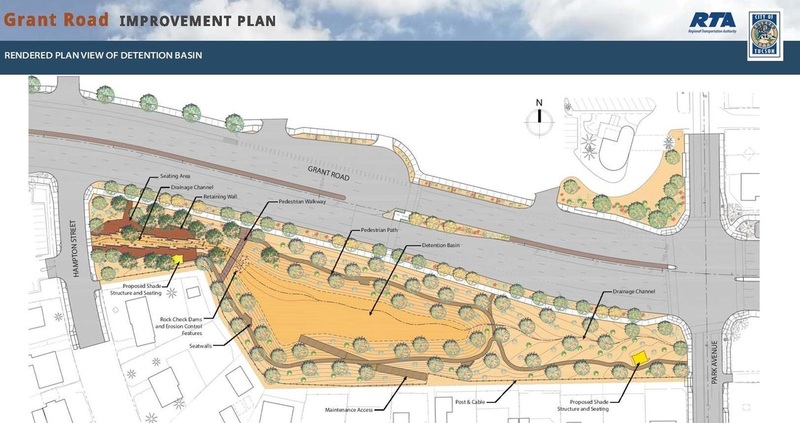 AN URBAN PARK AND HEALTH TRAIL: The City of Tucson in partnership with the RTA, PAG and the Grant Road Coalition-Central Segments submitted this grant to the State on May 7. It was the top rated grant in the state and was forwarded to the federal level for consideration. There will be 15 awarded and winners will be announced in October 2016. This unique concept addresses the area from Park Avenue to Santa Rita along Grant Road. ﻿Click here﻿ to see city website version of map where you can enlarge and scroll. The Grant Road Improvement Project extends from Oracle to Swan Road. Phase two and Phase five effect Jefferson Park. The widening of Grant Road will cause the loss of 23 properties which contribute the neighborhood's historic status. The "Grant Road Coalition" is composed of Jefferson Park residents and two other contiguous neighborhoods who meet with the Office of Integrated Planning on a regular basis to advocate for neighborhood protections. For more information on the coalition contact ﻿﻿Joan Daniels﻿, Jefferson Park Representative; ﻿Rebecca Ruopp﻿, Office of Integrated Planning, or ﻿Barbara Miller﻿, SAMOS representative. 1) To establish an interface between the Grant Road Project and the historic and residential neighborhoods along the one mile between First Ave and Campbell Avenue .